John Stoddard transported produce at Higher Ground Farm, on the roof of the Boston Design Center. The farm aims to supply neighborhood restaurants and markets such as Tavern Road. It is more than an acre of prime real estate on the Boston waterfront, with sweeping city views and a nice, if sometimes strong, sea breeze. But instead of luxury condos, this development has 25 tons of dirt, sprouting tomatoes, basil, and arugula as the city’s first rooftop farm finally takes root. After three years of planning, the Higher Ground Farm planted its first crop in July atop the Boston Design Center in the city’s shipping terminal in South Boston. For now, farmers Courtney Hennessey and John Stoddard are growing crops on a portion of the roof, using 1,400 milk crates as planters, until next spring, when they expect to have a more developed system that will resemble a long, unbroken farm field. At full build-out, the Higher Ground Farm will be 55,000 square feet, which would make it the nation’s second-largest rooftop farm using soil, after the two-and-a-half-acre Brooklyn Grange in New York City. Hennessey and Stoddard have gotten this far with minimal money — they raised $25,000 through a Kickstarter campaign — but still need another $250,000 to finance the larger farm. Then there was the permitting system. 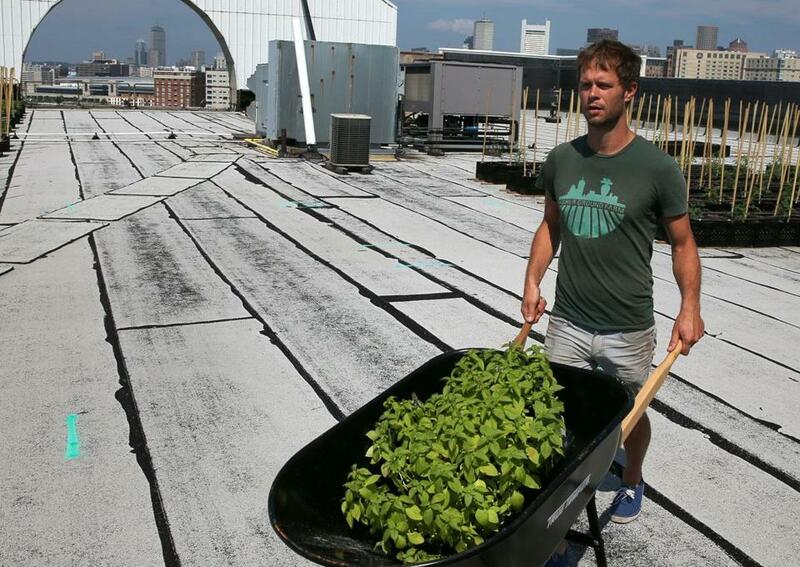 Because Boston regulations essentially prohibit rooftop farms, Hennessey and Stoddard had to undergo a laborious process to win variances from the city, and get permission for such elements as the irrigation system. Now the Boston Redevelopment Authority is going through a rezoning process to allow more urban agriculture projects that would include rooftop farms. 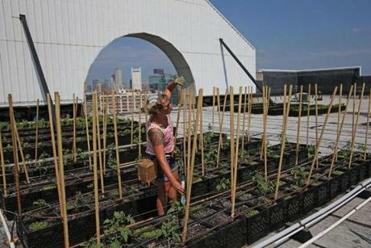 Courtney Hennessey of Higher Ground Farm cared for tomato plants on the roof of the Boston Design Center Wednesday. Hennessey and Stoddard have been friends for about 15 years, and after working in both the food and farming industries, decided to go into business together creating a sustainable, local food source. Stoddard has advised on food sustainability in both the health care and restaurant industries; Hennessey has restaurant management and commercial and urban farming experience. Even so, the pair is already looking back on the delays as a blessing in disguise, with the much smaller plot serving as a convenient testing period to get the business off the ground. Their first harvest is expected in two or three weeks, when the arugula will be ready, with the tomatoes coming in in late September. So far, Higher Ground has signed up several neighborhood restaurants and markets, such as Tavern Road and American Provisions, as customers, and is recruiting more among the Innovation District’s busy nightlife scene. Depending on the yield, Hennessey said she expects Higher Ground to make about $5,000 to $7,000 from this first crop. Once the larger planting system is in place, they expect to start a Community Supported Agriculture farm share program and open a farm stand outside the Design Center. Founded in 2009, Recover Green Roofs works with commercial and residential clients to create rooftop farms, as well as creating green spaces on roofs for schools and homes. The company created the complex planting-and-drainage system for the 17,000-square-foot rooftop farm at the Whole Foods in Lynnfield, which is scheduled to open soon. The rooftop system for Higher Ground, meanwhile, is a combination of a “built-in- place” system — the part of the farm that will stay put year-round — and a modular system of planters, which can move around on the roof, depending on snowdrifts. The 40-pound milk-crate planters, for example, will be relocated to the perimeter, while the built-in-place system takes up the bulk of the roof. The two-pronged approach is important in such a large space, when structural issues come into play. Before a speck of dirt made its way to the farm, structural engineers evaluated the Design Center, suggesting how Recover should tweak its design so the roof would not cave in when Higher Ground added tons of soil and plants. Another layer of structural support will be added to the roof in the coming months, as well as a waterproof membrane and drainage system. So far, farming is not the sole occupation for either Hennessey or Stoddard, even though they have been spending 10-hour days working the crops. Each has another job: Stoddard at a nonprofit, Hennessey as a bartender.